I'm super excited about how adorable this project turned out. What a great gift for any hard to shop for men in your life! You can also make these for kids on soda bottles like root been or cream soda. Or a wine bottle for your favorite hostess. Maybe we will even leave some for Santa! All you need are googly eyes, red poofs (is there a real name for those things?) and brown pipe cleaners-- I got all of these from Hobby Lobby for under $5 (enough supplies for more than three 6-packs!) I used elmer's to attach the eyes and noses, and just wrapped the pipe cleaners around the caps to the bottles. 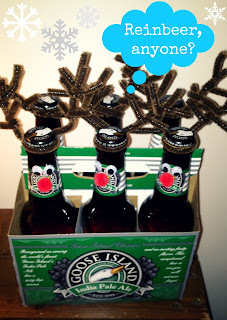 Tip-- lay the reindeers on their "backs" when while you let their eyes and nose dry! What's your favorite holiday craft this season?